Ohemaa Woyeje Sacked From Multimedia ? Adom 106.3 FM’s radio presenter Ohemaa Woyeje has been sacked by Multimedia for accusing a colleague for killing the late multimedia staff KABA Kumikasa.com can confirm. 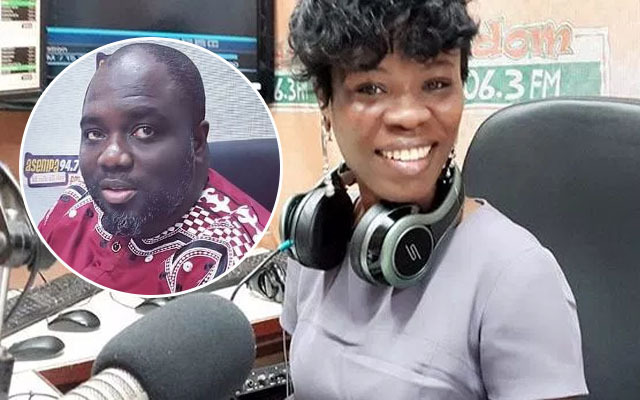 Whilst many are still sad over the death of the host of Ekosii Sen on Asempa FM, Adom FM presenter, Ohemaa Woyeje told the world about how one of her colleagues treated the late KABA badly before he passed on in a Facebook post. Ohemaa in a Facebook post Wednesday morning disclosed that Kaba told her weeks back about a lady at Multi TV who frustrated him anytime he was on TV. The Adom FM mid-morning show host added that she saw the lady who Kaba accused of frustrating him shedding tears like he loved the deceased when he was alive. Ohemaa Woyeje who described the lady as hypocrite said she wished Kaba would resurrect to slap all the fake mourners who pretended for the cameras. According to source,the award winning radio presenter was asked to apologize and to delete her delete her Facebook post as well.As we speak today,we can confirm that the astute radio presenter has been sacked by multimedia. KABA, 37, died on Saturday morning in a rather shocking manner. He had reported to work the day before but had to leave after complaining of feeling dizzy. He was later rushed to the Korle Bu Teaching Hospital when the sickness got worse but was pronounced dead not long after. His death has shocked many, with hundreds trooping to the Multimedia Group to commiserate with the family.